I know, I know, some of you are not criers. 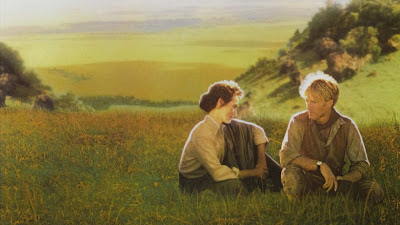 Amanda suggested a blog about having your girl card revoked if you don't cry at certain movies, an idea which I loved. I didn't want to limit it to the ladies, so there are some male friendly movies below. Marley and Me is not on this list, because the mere thought of my dogs dying brings me to tears, so I don't need to watch a movie about it. My Girl - We saw this on vacation in Ocean City, NJ, on a rainy day. Laura was at one end of the row and I was at the other. In the death scene, someone in the theater was sobbing so loudly, Laura was looking around to see who it was. She looked to the end of the row, and it was me. Loud sobbing in public. Damn you bees. Terms of Endearment - We were in MFD's parents' basement and it came on. I had never seen it. MFD was like oh, you should watch, it's good. He promptly fell asleep, only to be woken up later by my loud wracking sobs shaking the futon. Stepmom - I can't even. I don't even know what to say. 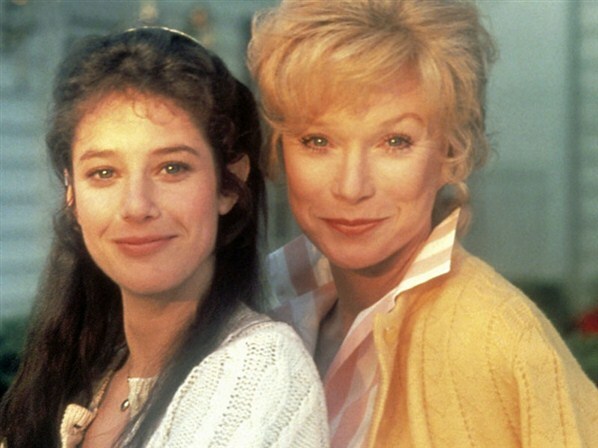 Beaches - A movie about losing your best friend, your female soulmate. Pass the tissues, all of them. Out of Africa - Just so much loss, of friends, of the farm, of love, of Africa itself. Disregard the colonialism. Steel Magnolias - Ugly crying at the cemetery scene. 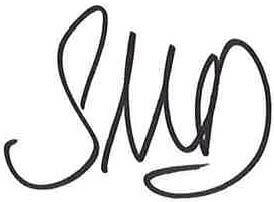 Ugly ugly ugly. Heartburn - This is a punch to the stomach for me, tears of anguish and anger. The Notebook - I shed tears in multiple places, for multiple reasons. Some may have been because my eyes were burning over Ryan Gosling's hotness, but most were over the story itself. 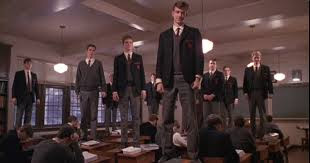 Dead Poet's Society - O Captain My Captain. Just as they jumped up spontaneously, my tears burst forth spontaneously. Amageddon - Why can't they all live? Sacrificial death = fat tears. 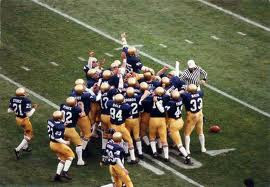 Rudy - Tell me you did not shed tears when the entire Notre Dame football stadium was on its feet chanting Rudy. I am tearing up just thinking about it. Perseverance and hard work paying off in triumph triggers tears. What movies turn on your waterworks? 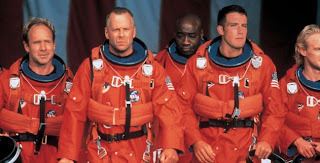 the only movie on that roster that i saw was armageddon and i didn't cry. then again, i wasn't as soft as i am now... i guess having kids makes me a softie because now i cry at anything sentimental! I am not a huge crier but movies (and freaking TV and commercials, oh and Today show segments) get me every time. When I saw this post title, the first thing I thought if was Armageddon. Complete sobbing meltdown every da,n time. Beaches and the Notebook i also get me, yet I will watch them every single time they are on. This is all I can think of at the moment, but it should be noted that I am NOT a cryer in general. UGH Dead Poet's Society! Gets me every time! Also The Green Mile and Rent. Glory - when a relatively unknown Denzel Washington carries the flag and the music swells and ... I'm done. When a Man Loves a Woman - when Andy Garcia shows up at Meg Ryan's AA meeting. And 4-year-old Mae Whitman? Heartbreaking. 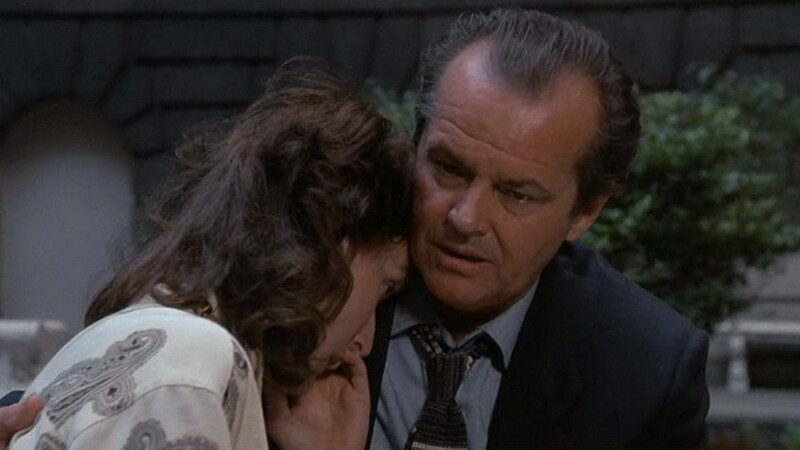 Awakenings - I sobbed uncontrollably long AFTER leaving the movie theater. Marley and Me - when Jen Aniston takes off the necklace and said "we were already a family." Oh God. Well I definitely cried at Rudy but most people know I don't have a soul... hahaha kidding! Life as a House with Kevin Kline & Hayden Christensen. If you haven't seen it, make sure have tissues on stand by ;) I cry at everything...cute things my boys do, commercials, TV shows, etc. Oh yeah - all tear producers for me! And don't tell anyone...Finding Nemo always makes me cry at the end. Ugh! I totally cry at commercials and movie previews, myself, so this is pretty spot on. lol. Gah, I just watched Marley and Me the other day and hated myself, after. Ok, I haven't seen all of those movies but I cried at every single one of them that I did see. My Girl, Stepmom, Armageddon, etc. I also cry my eyes out at LEGENDS OF THE FALL!! OMG!!! gets me every time! Ugh, the sobbing. I did not see many of those movies, knowing they would provoke big cries. Rudy was crying for happiness and pride. The TV movie Brian's Song made me cry every time. I really do not want to cry, so I avoid them. Really sad cries are the worst, especially true situations. I cried while reading The Notebook. JMJ, feel like crying now!! Mr. Holland's Opus got me teary at the end and although it's not a movie, I did cry at the end of the book "Where the red fern grows". In my defense I was 14 when I read it. Haha yes yes!!!!! Love this. I'm crushing right now thinking about my girl. Seriously, that movie is my childhood. My Girl gets me every time. 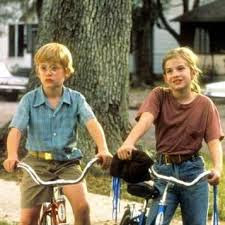 Also, What's Eating Gilbert Grape and I Am Sam were the first two that came to mind. I'm such a sap. 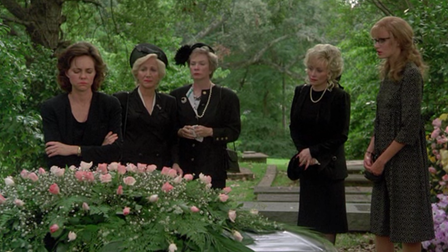 Steel Magnolias-- lawd. That movie makes you sob. It makes men sob. And Beaches, another ugly cry at the end. I wonder if I'm the only girl who doesn't like the move the notebook. I read the book, which was amazing. The movie, wasn't my cup of tea. I shall now be voted out of the chick flick club. I ugly cried at Up. Under my 3D glasses. Snot and everything. I still can't watch the first 20 minutes. Of those I have seen....whew....my chick card is safe. and hells no I'm not watching Marley and me. I can hardly take the constant Facebook posts about dogs needing homes. Cat lady? No. Crazy dog lady? That will be me. Oh Dear Lord, The Notebook, My Girl and Beaches....those three get me every single time...like my eyes are swollen after I watch them!! All of these movies are such tear jerkers! I haven't seen all that you listed, but the ones I have, ugly crying at all. The Story of Us - when Michelle Pfeiffer says, "I want to go to Chow Funs" I immediately start ugly crying. Great list! But I hated The Notebook. You can revoke my girl card now... I saw it in the theatre when it came out and haven't seen it since, so maybe now it would be better. Yeah.... I straight up have no soul. The only ones are Armageddon and Stepmom. I f-ing hate the Notebook more than anything else on the face of this earth. And Steel Magnolia's is not far behind. "you've got to give a little- take a little, and let your poor heart break a little...."
And yes, Steel Magnolis defnitely. The graveside scene gets me until Clairee tells M'lynn to hit Ouiser. "Hit this, Go ahead, slap her- we can sell shirts sayin' I slapped Ouiser Boudreaux!" My Girl, Beaches, Step Mom... Yes, yes, yes! I can't even think about Step-Mom without getting glassy eyed. Definitely add "Life as a House" to that list. I cry for at least 1/2 hour after its over and Bill "I never cry, EVER" Bell has wiped a tear away after that one. I'm ashamed to admit that I've only seen the Notebook and Rudy. What a saaaaad life I live!! Man did I cry through ALL of those. 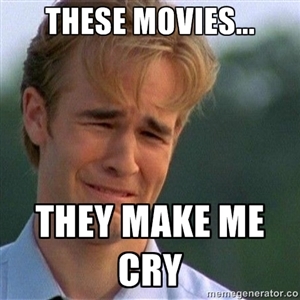 Also Marley and Me, Hope Floats (losing you momma, AHH); The City of Angels, A Time Travelers Wife, MY Sister's Keeper.... I cry. Like you.. Ugly loud, can't even deny it's me crying. Cannot Do Any Animal Movies. Old Yeller & Done. I cried during The Notebook but am over it due to the endless "I LOVE THE NOTEBOOK" fans that beat it to death. Stopped reading Nichols Sparks as I also cry at morning show segments, commericals, tv and movies do not need to go knowingly into a book that will reduce me to tears. Actually I was surprised at the end of a book I just read and thought "bastards got me!" Yes to all of these! Except for Heartburn. I've never even heard of it. Looking it up, stat! I love that meme so much. Oh, Dawson. Heartburn is streaming on Netflix!! I am a little late to this party but I wanted you to know, I cried watching "Ted" the other night. Yes. Ted. There's a sad part with sad music.